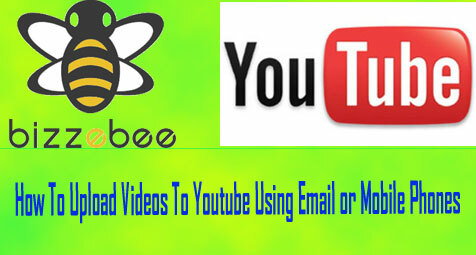 Did you know that there is a way to turn your Twitter, Instagram, Facebook and YouTube channels into paid memberships? Yep, that’s right, there is a way for people to pay you to get more of the content that you share without having to build a dedicated website. 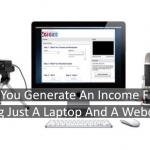 With YouTube, you can earn from the adverts shown on your videos if you are a YouTube Partner enrolled into their AdSense system but this is not always as profitable as some people would hope. Unfortunately more and more people are using ad blocking software to block adverts from showing on websites including YouTube. 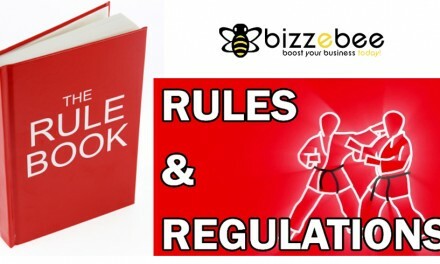 This has drastically reduced people’s income and potential income for new starters. However, do not be too disheartened. If you would like to work from home blogging, writing, producing music or videos there are other ways. 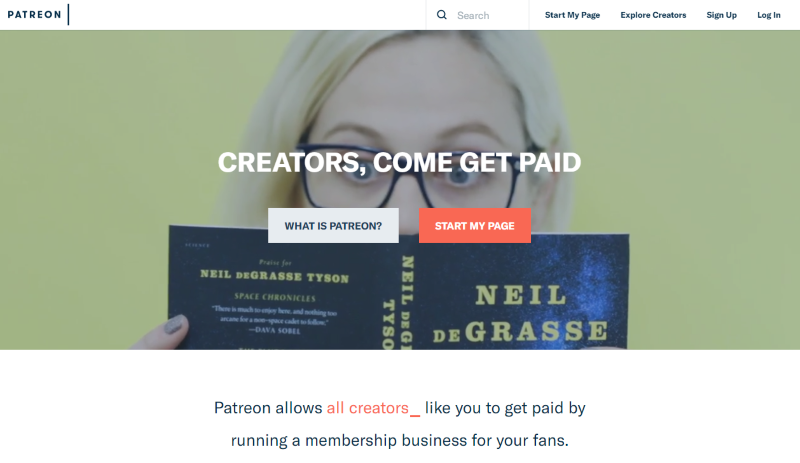 One such way is to use the third party website called Patreon. 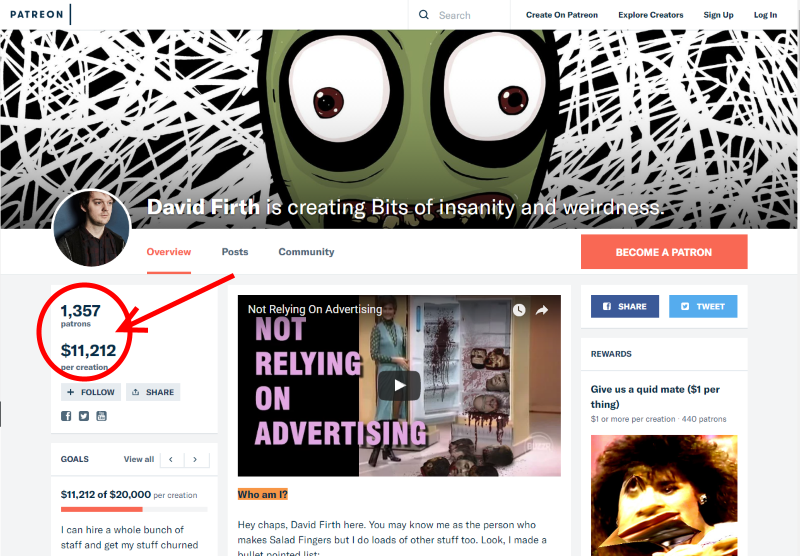 Patreon allows your fans and followers to subscribe to you allowing you to continue to create and share new content regularly. 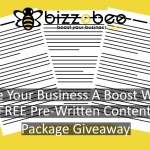 It is kind of like an ongoing Kickstarter – a membership where people pay monthly – or per product – so that you can carry on with the good work. 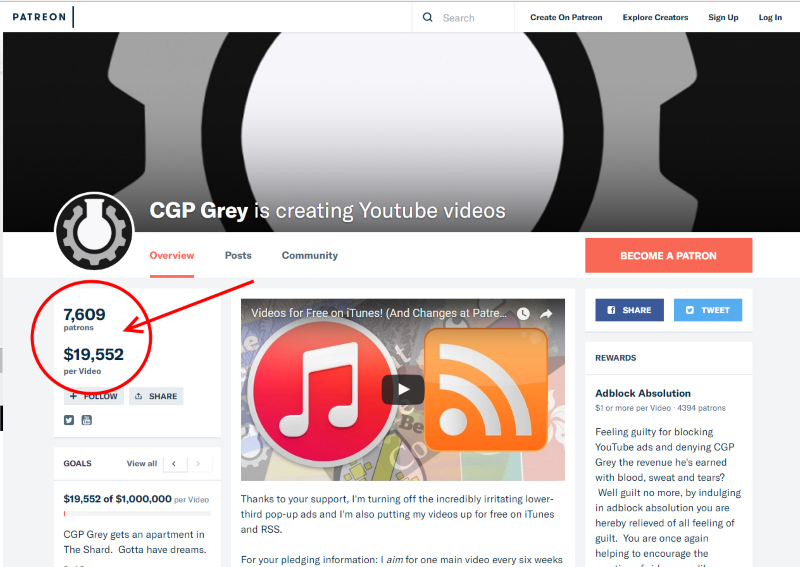 Many YouTubers now use Patreon, first they build up a following of loyal fans then they promote their Patreon page to their followers. They use it alongside YouTube’s partner program to earn extra money, for some they probably earn more via Patreon than YouTube’s own Partner Program. Similar to Kickstarter you can set different levels, you can have a low $1 a month subscription upto ?? per month (As yet I don’t know if they have a ceiling price). 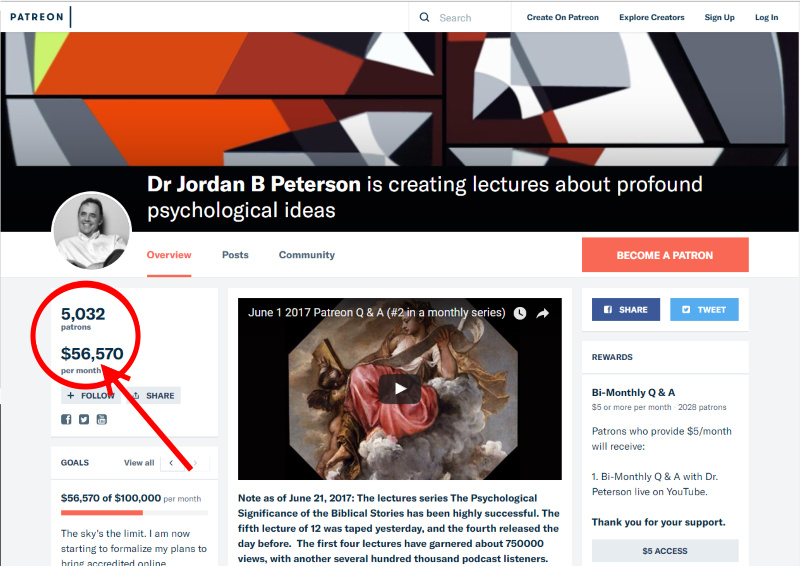 When people buy a subscription and start handing money over to you – well to Patreon who then pass it onto you later – you will produce extra content which you share with your fans on the Patreon page. That is unless you have stated that the subscription fee allows you to keep producing content which you share via the normal platform. 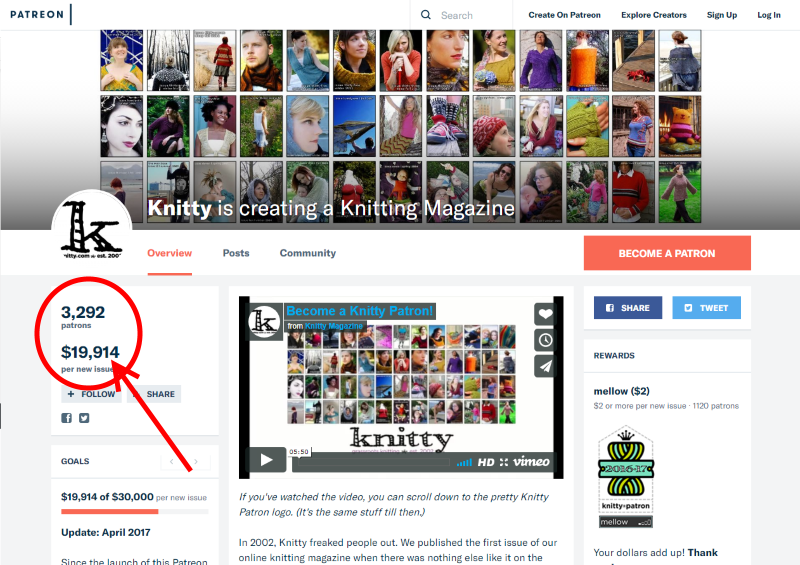 Patreon can be used by many different content creators and not just YouTube video creators. There are writers, musicians, comedians, life coaches, pranksters and travellers. A lot of them do use YouTube to share their travels, pranks and comedy shows but writers, motivational speakers and musicians will share their content using other mediums like ebooks, PDFs, photos and audio podcasts. There are women – and possibly men – who also use Patreon and a similar site called Onlyfans.com to share explicit pictures and videos which they are unable to share on sites like YouTube and Instagram. Twitter does have a very dark and seedy side to it but why share your most revealing and naughty content for free when people are willing to pay for it? They use Twitter and Instagram to build that important following – the social media equivalent to an email list – but better. 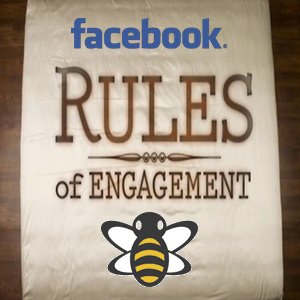 A following is more interactive and often more responsive for picture, video and audio based niches. 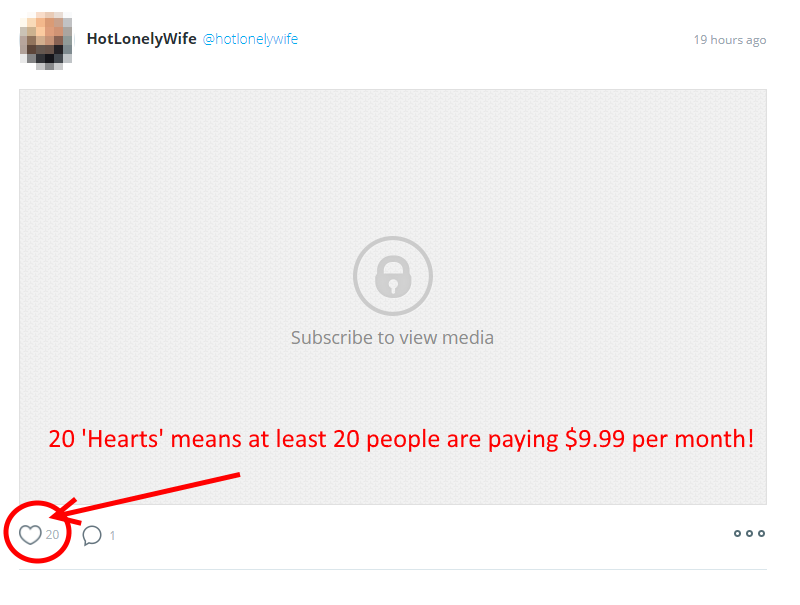 I recently checked out one woman who charged $9.99 a month on OnlyFans.com and although I couldn’t access her content I could see that one picture (above) had 20 Likes which told me that she had at least 20 people paying the $9.99 to see her content giving her an easy $199.80 a month. Obviously minus OnlyFans.com’s fees/cut. As far as I can tell, OnlyFans doesn’t have separate price tiers meaning that you charge the same flat rate monthly price but you can charge upto $49.99 a month for your content. You can start adding and sharing your content as soon as you sign up to these platforms and they already have the payment collection system in place so they deal with collecting payments leaving you to focus on producing great content. 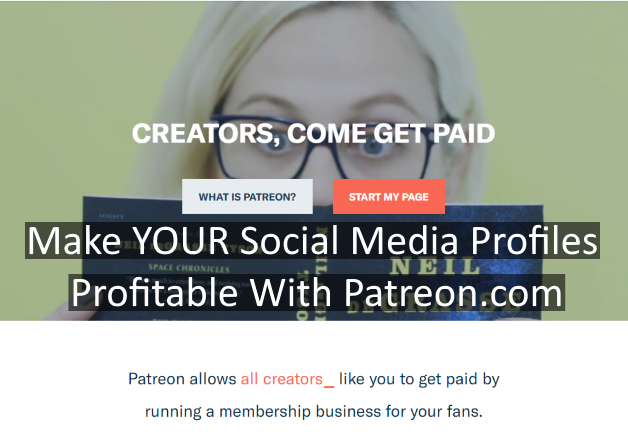 The only downside to this is that should they – the third party service of Patreon or similar sites – decide to close down your account you lose all of your subscribers, income and content. Obviously you will have the content stored on your computer somewhere but it will suddenly disappear from the web. If you have your own website and control your content and payments yourself you are more protected but even then there are the risks of being hacked or the hosting company closing you down. 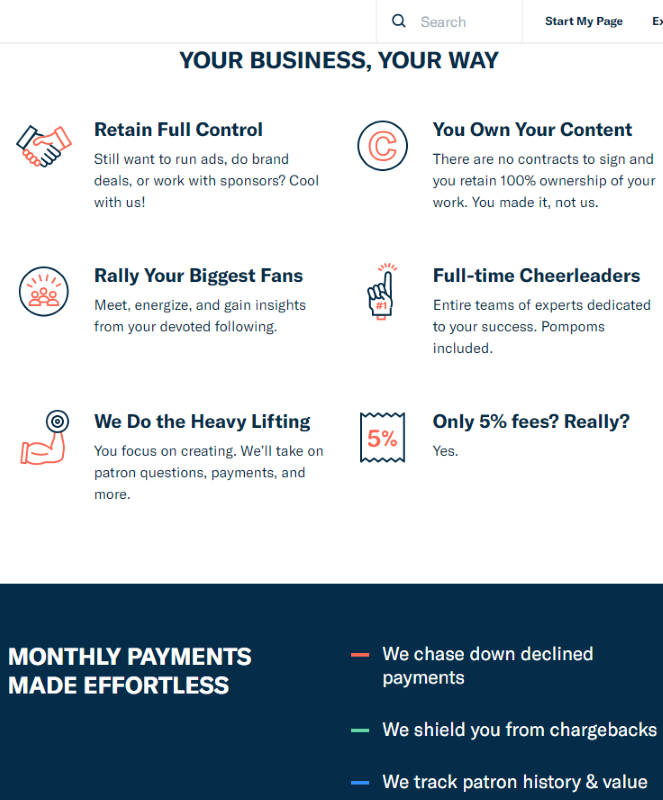 I personally think services like Patreon and OnlyFans are brilliant services for content creators who want to earn money from their own products. People generally don’t like paying high fees for services but you would need to pay hosting fees and developers fees to run your own membership website. The fees for these kinds of services is the price you pay to allow you the freedom from technical issues and stress associated with running and building your own website and they give you the freedom to get on with most important aspect of your work – the work itself! The fees also cover the running of their platform including all of the administration involved with taking payments. Services like Patreon have allowed ordinary people like you and I to do what they love and not need to go out and work a dull day job. It’s a win – win in my book. 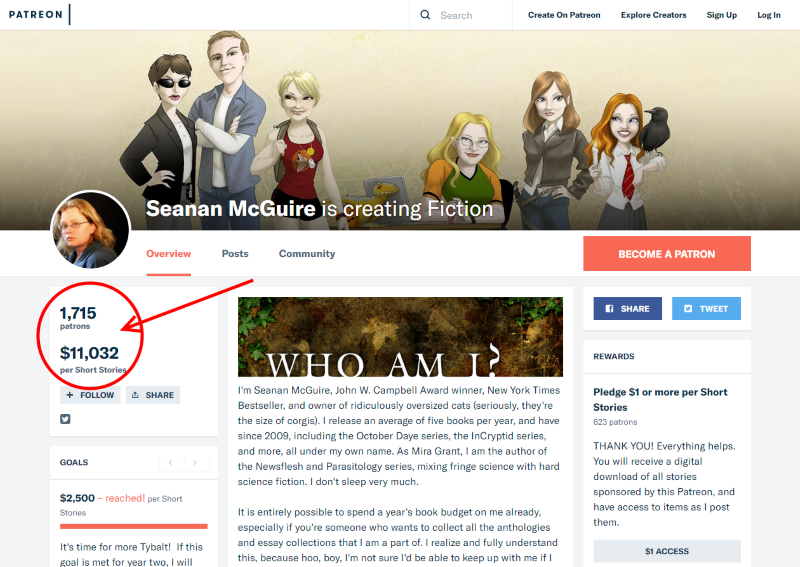 You should also note that there are people who are not successfully using Patreon too. Some have tried and packed up in the past when they were not getting subscribers. 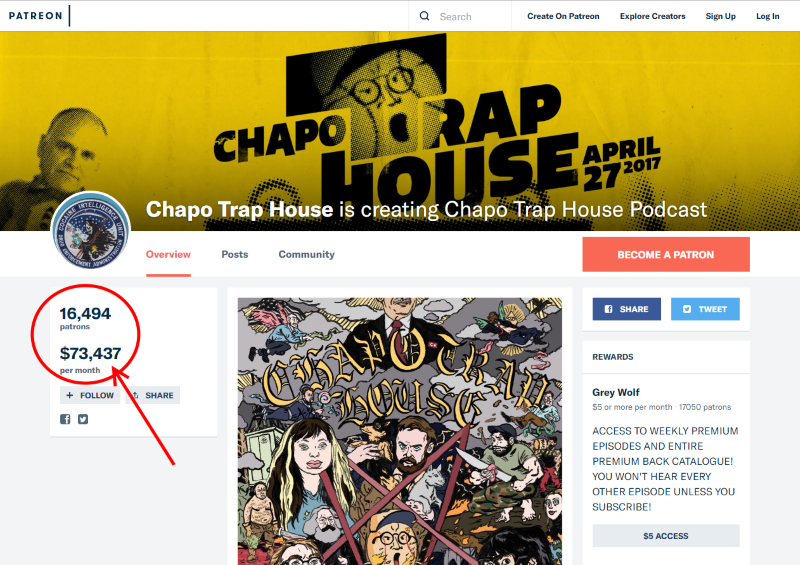 This I think is down to a combination of a couple of things, they set up their Patreon account without any kind of following or fans and hoped that people would magically appear and subscribe to their great content and the niche/topic that they were focusing on was not that great or interesting. Patreon is something that you set up and promote, you cannot expect people to suddenly magically appear and start handing you money. 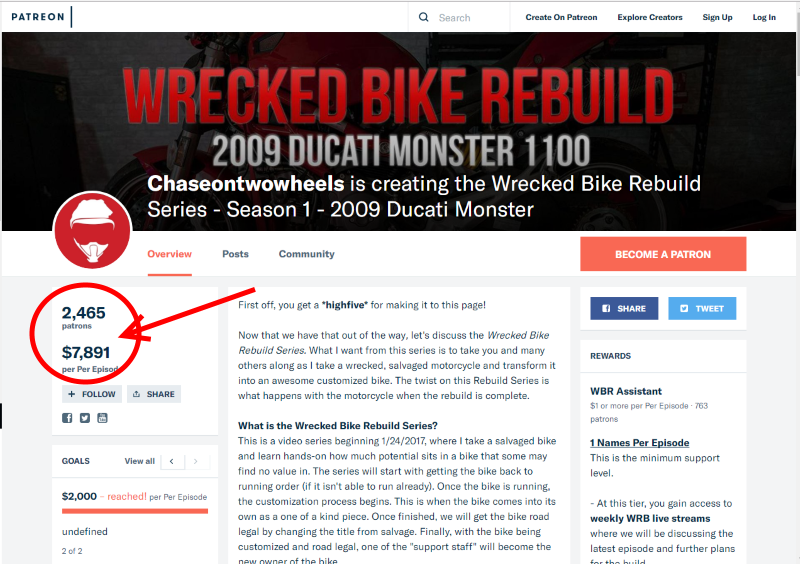 It is best that you build up a following first so that you can show them your Patreon page or at least know where you can find a lot of people who might be interested in what you make and offer. For a Patreon and OnlyFans profile to work you must first have a hungry audience of people who want what you are offering! Thanks for another informative site. Where else could I get that kind of info written in such a perfect way? I’ve a project that I’m just now working on, and I’ve been on the look out for such information.